Coconut pancake recipes can be a great alternative for people on a gluten free diet. And buckwheat pancake recipes can be another great gluten free alternative for your morning breakfast. A buckwheat pancake recipe uses a fruit seed that is known to contain many health benefits and was used by the Ancient people of Asia. Buckwheat flour is also considered to be a low glycemic food. However, if you want a low carb pancake recipe, using coconut flour will be the better alternative. 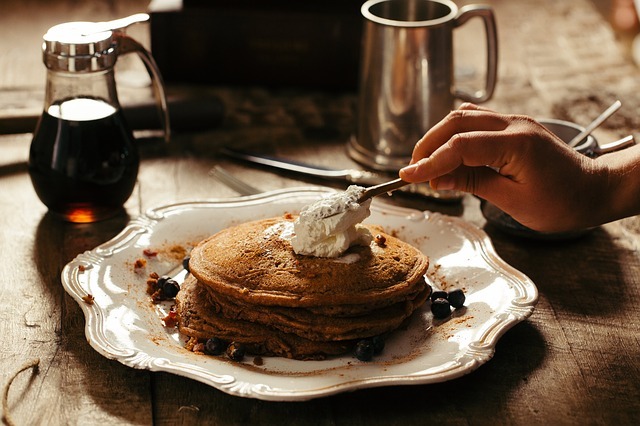 And by using healthy sweeteners you can add a little sweetness into your pancake recipes without overly spiking your blood sugar level which is also a better alternative. In a medium bowl, add the kefir or yogurt. Then mix in the baking soda to activate the rising agent. Stir in the cream or butter. Then stir in the egg and salt. Add sweetener if desired and lastly the buckwheat flour. Stir until well combined. Heat a pan on medium heat with a healthy oil and scoop large spoonfuls of pancake batter into the heated pan. Put a lid on the pan and cook for 2 minutes. Remove lid and flip pancakes with spatula. Put lid back on and cook for 1 more minute before removing. Sprouting helps to make the nutrients in buckwheat more readily available and also helps with digestion. You could make your own sprouted buckwheat flour. Or just buy organic sprouted buckwheat flour. You could also ferment unsprouted buckwheat flour before using in your buckwheat pancake recipes. Fermenting also gives you a healthier and more digestible buckwheat pancake. Learn how to properly ferment buckwheat flour so that you can make this fermented buckwheat pancake recipe. Use an immersion blender or your favorite high speed blender to whip up your coconut pancake recipe. Then spoon the pancake batter onto a greased griddle and cook pancakes on med-low heat. When you see bubbles starting to form in the middle of pancakes and the edges start to firm up - flip pancakes and cook for another minute or two before removing from heat. I love coconut pancake recipes because they actually taste like "real" pancakes and come without the stomach pains from gluten. Coconut pancake recipes are also known to be lower in carbohydrates. And there are many good brands of coconut flour on the market these days to choose from to make your coconut pancake recipes. Coconut Secret also makes a really good coconut syrup sweetener that is also a raw low glycemic sweetener. You could also experiment with a little almond flour along with the coconut flour in your pancake recipes. Although, you may have to change other measurements as these two low carb flours work quite differently. You can also make your own powdered or liquid stevia from dried stevia leaves for an alternative. Whisk butter, cream, sweetener, salt, eggs, and vanilla together in a bowl. In another bowl, combine coconut flour and baking powder. Mix dry ingredients with the wet. Let the batter sit to thicken for a few minutes. However, if batter is too thick - thin out with more cream or water. Heat a slightly oiled skillet on medium heat. Spoon heaping tablespoons of batter onto the skillet. Flip pancakes when ready and finish cooking on other side before removing from pan. Yakon Root Syrup - made from a root that has a sweet flavor. This sweetener is low on the glycemic index scale and is also low in calories. It's full of important minerals and is considered a prebiotic. This sweetener has a high amount of FOS sugar which is a sugar that our bodies can't metabolize and reminds me of molasses with its rich dark color. Coconut Sugar - is a sugar that is low in fructose and has a Low Glycemic Index of 35. It is made from the sap of coconut flowers and contains a good amount of important minerals. This low glycemic sweetener resembles brown sugar in taste and in color. Lucuma Powder - has a very pleasant maple-like taste and comes from the lucuma fruit. It's typically made from fruit that has been dehydrated at low temperatures and then milled into a fine powder. This sweetener is loaded with beta carotene, vitamin B3, and minerals. It is also considered a Low Glycemic sweetener. Mesquite Powder - is made from the pods of the mesquite tree. This sweetener has a sweet caramel taste and is high in protein as well as in important minerals. Mesquite scores low on the glycemic index scale and will balance blood sugar levels.